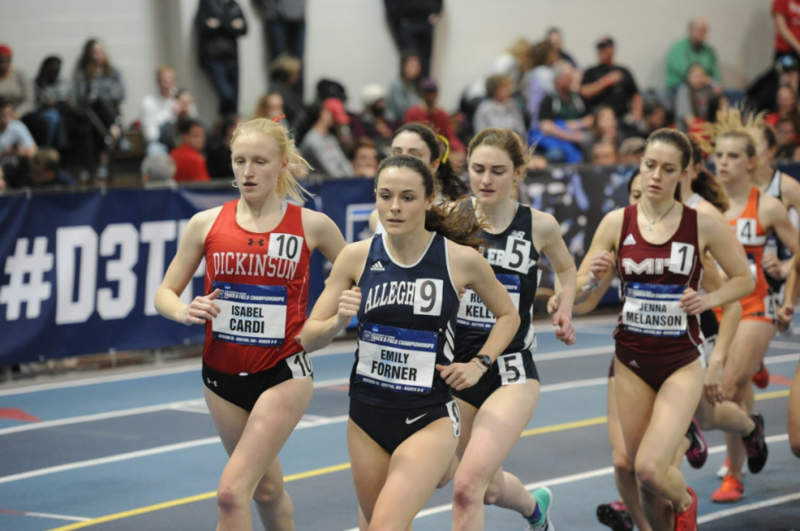 Emily Forner, ‘19, leads the pack in the 3,000-meter run at the 2019 NCAA Division III Track & Field Championships at the Reggie Lewis Track and Athletic Center. Forner’s win made her the first individual national champion to come from Allegheny’s women’s track and field program. It was a new experience. A new place, competing against new people and an opportunity to set a new record. 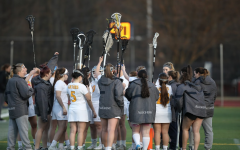 And Emily Forner, ’19, knew the chance was now or never to make it count. After making the trip from Allegheny College to Boston, Forner was preparing for the NCAA Division III Indoor National Championship at the Reggie Lewis Center Track and Athletic Center in the 3,000-meter run for the second year in a row. The preliminaries were held March 8, and Forner was unsure how she would fit in after coming in 12th place out of 20 last year. But Forner came in first place and was the first seed for the main event, which she said provided her with the confidence she needed for the big day. “Last year, I thought I was just lucky to be there, but this year, I knew I was meant to be there,” Forner said. When Forner had a night off from training, she was able to explore Boston by going to the New England Aquarium and the Boston Public Library. Forner said she made sure to get an ample amount of sleep and wake up the next day prepared for what was to come. She followed her pre-meet routine of eating about four hours before the event, leaving time for the food to digest. After eating at Panera Bread, she headed to The Reggie Lewis Center to prepare for the national championship. During the race, according to Forner, she started out faster than she wanted, so she decided to slow down and stay among the first three people. After the first mile, she moved up to first place and tried to hold her ground there. With the sound of feet scrambling not far behind her, Forner did not let up. With teammates and fans cheering her on from every side, Forner said she only had her mind on one thing: winning. She was able to maintain her lead, and within the last 100 meters, she knew she had it in the bag. She beat her preliminary time by nearly 14 seconds and set a personal record with a time of 9 minutes, 39.56 seconds. With the win, Forner became the 13th individual national champion in Allegheny sports history. Despite her recent success, Forner was not a born star. Mourer explained that over the past four years, Forner has worked not only hard, but smart, too. Her success is more impressive because she started running competitively when she was already a sophomore in high school. Her brother was a cross country runner in high school and she decided, “on a whim” to follow in his footsteps. From that point, Forner’s running journey came with success and struggles. From health issues to just not running well, Forner had thoughts of quitting but credited her team for helping her decide to stick with it. Six years later, all of Forner’s hard work has paid off. So much, in fact, that she has become a role model for others, according to her teammates. Molly Tarvin, ’22, typically runs the 3,000-meter event as well. Being part of the same event, Tarvin has been able to use Forner’s strategies and successes as motivation and learning tools for her future at Allegheny. “Seeing her progression from high school to where she is now and hearing her stories about how she’s improved with the help of the Allegheny cross country program really gives me hope that if I work as hard as she does, I might also improve,” Tarvin said. Even after winning the gold and inspiring others, Forner is not done yet. With the outdoor track season on the horizon, Forner still has some unfinished business to take care of. Because there is no 3,000-meter race for the outdoor season, Forner will be running the 1,500-meter and 5K. Although the outdoor season is beginning soon, Forner and her team still use this time to reflect on her hard work and take in all that she has accomplished. “She’s earned her championship and everyone associated with our track and cross country program is proud of her accomplishment,” Mourer said. Forner’s story-book ending was the icing on the cake for her final indoor track season, but now she is focused on setting new records for the outdoor season.